The Australian Competition and Consumer Commission on Friday local time issued a determination denying the country's big-three banks authorization to collectively negotiate with Apple over access to Apple Pay NFC technology. Today's decision follows an initial draft determination that denied a proposal to negotiate filed by the Commonwealth Bank of Australia, National Australia Bank and Westpac Banking Corp, along with Bendigo and Adelaide Bank. "The ACCC is not satisfied, on balance, that the likely benefits from the proposed conduct outweigh the likely detriments. We are concerned that the proposed conduct is likely to reduce or distort competition in a number of markets," ACCC Chairman Rod Sims said. Sims went on to say that while the ACCC acknowledges the fact that granting the banks authorization would put them in a better position to bargain, the "benefits would be outweighed by detriments." 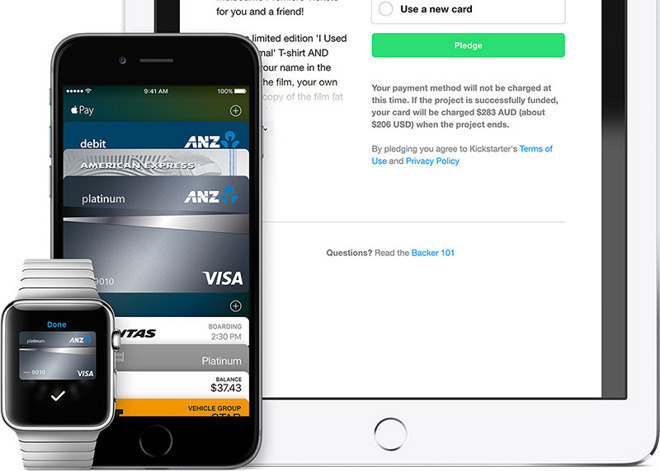 First lodged last July, the three Australian banks initially requested approval to collectively negotiate the installation of non-Apple Pay software on iPhone hardware. Among the contingencies tied to the bargain was a stipulation that would allow the banks access to iPhone's NFC controller, a key piece of communications hardware that Apple has kept under lock and key. For its part, the banking bloc argues access to iPhone's NFC would foster increased competition and consumer choice, as well as accelerated innovation and investment in the digital wallet space. As a result of opening the technology, consumer adoption of mobile payment platforms would increase, the group says. While the ACCC agrees on the point of increased competition, the regulatory body noted three distinct drawbacks to the banks' demands. First, access to iPhone NFC hardware would disrupt the company's integrated hardware-software strategy, thereby impacting how Apple competes with rival Android handsets. Since mobile payment platforms are relatively new to Australia, a steady stream of alternative devices like smartwatch and fitness wearable products are constantly making their way to market. The ACCC says the presence of these new device form factors makes it difficult to gauge how competition might develop in the future. Sims notes that granting access to iPhone hardware assets might artificially skew development of payments technologies toward NFC, prematurely killing off other burgeoning innovations. "Finally, Apple Wallet and other multi-issuer digital wallets could increase competition between the banks by making it easier for consumers to switch between card providers and limiting any 'lock in' effect bank digital wallets may cause," Sims said. In a statement provided to AppleInsider, the banks expressed their disappointment in the final determination and said they will individually review how best to move forward. "This case has always been about consumer choice," said banks spokesman Lance Blockley. "The applicants made this application to seek to ensure they could participate in the future of mobile wallets, and not have the course of development for mobile wallets in Australia dictated by a single overseas corporation." While current digital wallet technology deals mainly with retail transactions, ongoing development points toward future innovations that could replace all physical wallet assets, Blockley says. For example, certain payments platforms, including Apple Pay, allow users to purchase mass transit tickets and access to other venues. Alternative solutions feature support for loyalty programs and even personal identification. "Apple has a stated desire to own the entire mobile wallet, and will use the beachhead into mobile wallets afforded to them by complete control over mobile payments on iPhone to exert control over the rest of the digital wallet," Blockley said. "This in our view is aimed at increasing the services revenue they can earn from iPhone users."